Was it a road accident or was it a planned murder? Twenty-three years have elapsed, but Dashdhunga incident still remains an unsolved mystery. 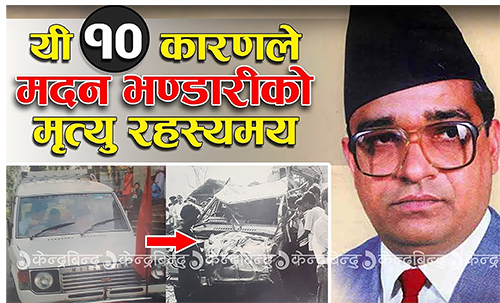 A vehicle carrying Madan Bhandari, then general secretary of the CPN-UML, and another leader Jibaraj Ahsrit, reportedly, met with an accident in Dashdhunga, Chitwan on May 16, 1993. Only the driver, Amar Lama, had survived. Not only the CPN-UML but the entire nation mourned the demise of Bhandari, a promising leader who opined that communists could achieve their ultimate goal even through democratic participation. The UML has refused to accept the incident as an accident, claiming that it was a planed murder of a promising communist leader. Meanwhile, the circumstances, available facts and statements from people questioned during the investigation process only deepened suspicions around the incident. The UML had launched protest programs for months demanding thorough probe into the incident. The then government led by Girija Prasad Koirala had formed a judicial probe committee under Justice Trailokya Pratap Rana. The UML also formed a probe committee led by KP Sharma Oli, the incumbent Prime Minister, while a committee led by Padma Ratna Tuladhar was formed terming it a public committee. 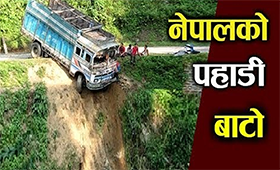 Oli and Tuladhar committees concluded that the incident was a conspiracy while the Rana-committee said it was a road accident caused by driver's negligence.